Application of external fixators in the management of severe fractures has become an important part in the management of polytraumatized patients. Parallel to the development and presentation of new external fixators during recent years we have been confronted with numerous publications on where and how these fixators might be used. Over the past years, it has been increasingly accepted that the corrent application of external fixators requires a sound understanding of the mechanical characteristics of these devices; furthermore, it became obvious, mainly following a number of disappointing clinical results, that masterful skills in surgical techniques are absolutely essential. As demonstrated best by workshops on external fixators held during the last three years in North America, this issue has become very complicated for the majority of common orthopedic surgeons, and even confusing with regard to the basic mechanical data available about biomechanical results. How can highly specialized knowledge of a small aspect match the needs for a sound integrated knowledge of the various problems in the management of a polytraumatized patient? Some of us have found an answer to that question in that we try to escape involvement in the emotionally exhausting treatment of multiple — injured patients. 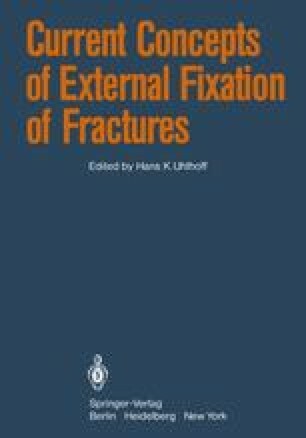 The others who must share the responsibilities for the treatment of these patients are frequently confused, particularly when reading recent publications on indications for external fixators stressing the fact that there is nowadays almost no skeletal part which cannot be successfully managed by external devices. This, we believe, implies a risky management of musculoskeletal injuries in polytraumatized patients, since opportunities for definitive and appropriate fracture fixation often will be missed.